all the little stories» Blog Archive » lessons learned. I am thankful that with all that I have going on in my day—the cooking and cleaning, the design work, the running of a large on-line shop—that right now I’m feeling so motivated and excited about the things we are tackling during school time every day. Planning out lessons for school leaves me feeling creative and also more aware of the little things in life… it’s like I get to see behind the veil when I’m planning out these fun and tricky little ways to help Katie learn some new thing and I’m both excited and curious to see how it works for her! It takes the mundane and makes it fascinating. And I find that I keep looking for unique ways to teach her something new! My wheels are always turning. I’m sure this is how those people who were born to teach feel on a regular basis—that passion for learning. What a great feeling! It’s exciting. I was looking at this page in Katie’s Phonics Pathways book full of examples of what we do when we add a suffix to a “Silent E” word (such as hope = hoping). Next to that list of words, there was a list of short-vowel words that end up with a double consonant before the suffix (such as mop = mopping). Well, I looked at this page and I thought, “Oh, my word–just one page dedicated to this topic? We are not going to get this in one go!” It looked like it was going to be a real challenge for Katie to simply read moping off the page and know that the root word was “mope” and not “mop.” And then next to that was mopping. I foresaw tears in our future. Sure, we are trying to drill a new rule about “Silent E” here. But it’s a little early for her to really get this concept without breaking it down a little more. Then inspiration struck! 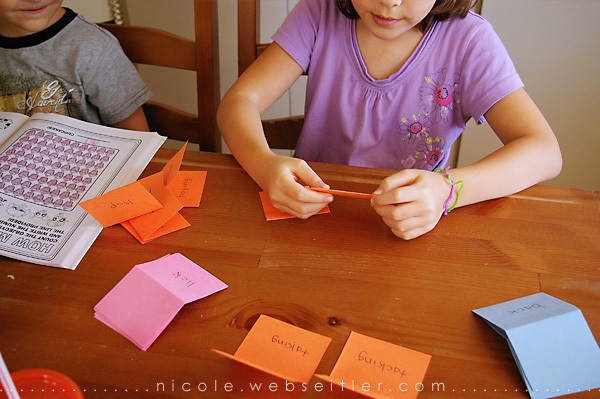 So, what I did was I got out some construction paper and cut out eight pieces to fold into little paper cards. On the outside of the card I wrote “mope” and then when you open it up on the inside is the word “moping.” Then there is a matching card that says “mop” on the outside and “mopping” in the inside. I figure this is going to be a more concrete and helpful way to tackle this lesson. Plus, it’s hands-on. I was reading a Montessori book I picked up from the library this weekend and while I didn’t care for a lot of what was said in the book, a few things were really insightful. One was Montessori’s concept that you should never give something to the Mind that you have not first given to the Hand. The idea is that the child is more actively involved and paying close attention when something is hands-on. And thus, they are more likely to retain it. And let me tell you—we aren’t just doing this stuff to check off a checklist. Retaining it is our goal! The other thing I gleaned from the book I borrowed from the library had to do with Penny. For a few weeks now, it’s felt like Penny was on this kick of trying to get into as much trouble as possible. Come to find out, she’s going through a new stage of learning! At fifteen months, little ones start enjoying being very independent. The book described how they become intensely curious about “the real world” around them and this has been true for Penny! She can be found all over the house, investigating (and trying to get into!) anything and everything. The book went on to say that it’s really sad how sometimes we’ll handle this new challenge by plopping the little troublemaker into a playpen. But if you leave them alone and just observe what they are doing, you’ll be surprised. 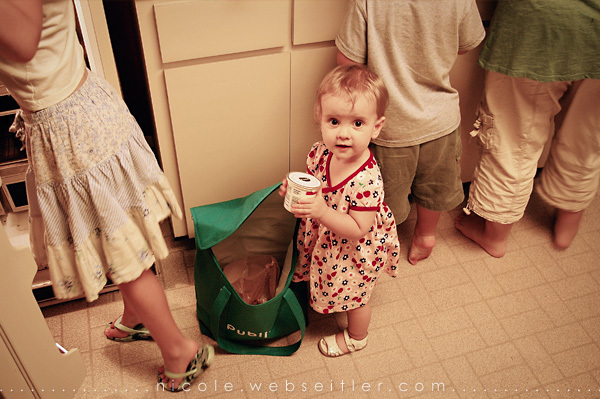 They are extremely interested in household things—they want to be our little helpers! I thought that Penny was just obsessed with messing with my flip-flops. Once I stopped telling her “no” about it I found out that what she really wanted to do was bring them to me, since they obviously belong on Mommy’s feet. I also have a cloth napkin that I keep over near my desk for when I’m eating lunch at the computer. I’ll often find that Miss Penny has come by to visit me while I was working on something and left me a little present—the napkin is resting on my leg, because that’s where it belongs! She also looooves to play with my cloth tape measure that I keep in my knitting basket. In fact, for the most part I’ve noticed that she’s abandoned all her own toys, except for a few favorites, and she now carries either her siblings toys or real world items of mine around the house, which the book said is a rather common occurrence. I was kinda tempted to say “Nooo! Not the yogurt, Sweetie!” But, seriously—how cute is this? So, now instead of constantly “No, no, no!” to her, I’m saying “Why, thank you, Penny!” and trying to understand what she’s thinking about when she does the silly little things she does. 1. I was invited to be a member of The Digi Dares team! And that means you’ll be seeing me share more layouts soon, as it’s my goal get this year digi scrapped. 2. This week I’m working together with another digital designer who is a HUGE hero of mine. I’m very excited about our new collaboration, which should be out next Thursday. 3. I’m contemplating running a class at the Digichick… still in the planning stages, but I feel pretty inspired to do it. I just need to figure out a few of the ins and outs of running the thing. And then develop all the course material—which is just a wee bit intimidating! But still in the face of all that, I think this will be a great thing for the community! 4. Tomorrow I will be 20 weeks pregnant! Half-way. ::blink:: You know, I’m still in shock that I’m even pregnant. I’m going to be holding a new baby before I know it, wondering just where this little one came from. This entry was posted on Friday, September 3rd, 2010 at 1:53 pm and is filed under family, homeschooling, just life, katie, penny. You can follow any responses to this entry through the RSS 2.0 feed. You can skip to the end and leave a response. Pinging is currently not allowed.